Take a scenic flight by helicopter over the iconic sandstone formation known as Uluru as you sit back and relax taking in the incredible birds-eye views on offer. Views of Kata Tjuta while flying over Uluru. 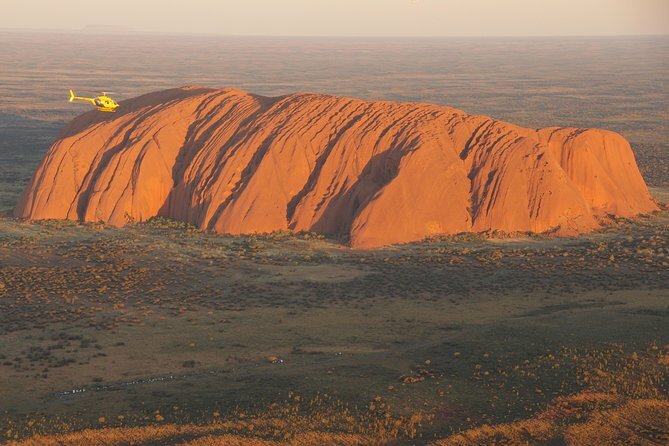 Experience unforgettable views as you fly over iconic Uluru. This 15 minute experience offers one of a kind views giving you the chance to capture the incredible Northern Territory in all it's glory. Glide across the World Heritage listed Uluru and Kata Tjuta National Park after departing from Ayers Rock Resort. Make sure to bring your camera with you as the helicopter offers incredible vantage points through their specially designed windows. See iconic Uluru the best way possible - By Air - as you glide over the incredible monolith taking in a range of incredible views otherwise unattainable by foot. Here you'll see the incredible 36 dome-like rock formation making up Mount Olga made up of a range of different rock types including granite and basalt, cemented by a matrix of sandstone. This unforgettable experience will be one you are likely never to forget.